This is not your regular puzzle cache. 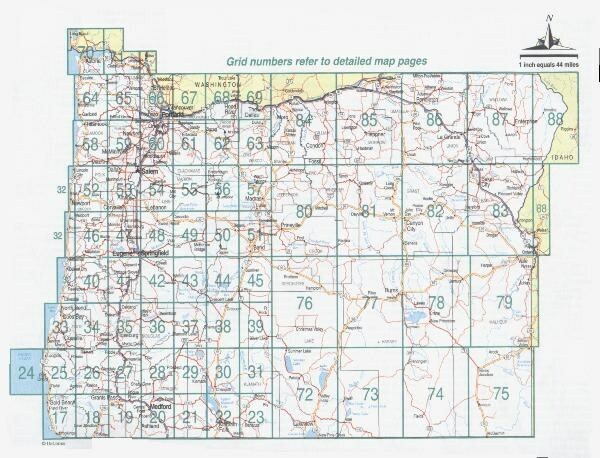 The listed coordinates are not to the cache, they are to an area in southern Oregon. By the time you are finished you will have traveled all over Oregon, spent your life savings on gas, and said a few bad words about me for setting this up. NOTE: Due to the different changes since the Challenge was set up We will accept whatever edition you have as long as you let us know how many sections it contains. Recently, I was asked a simple question by some friends and fellow cachers from California, who shall remain nameless for their own safety. "Have you ever heard of the DeLorme Challenge". After learning what it was all about I decided to host the Oregon version. I did this for a few reasons. First, my friends asked me to. Second, it will get people to see our great state. But, the main reason, by hosting it, I will not have to complete it! I know people in Oregon tend to blame Californians for a lot but, this time it is true. This type of challenge started in California but, several states now have them. The challenge is based on the DeLorme Atlas & Gazetteer book. If you don’t already own one, you should get one. It is a wonderful map book which I have been using since starting this crazy game. The state is broken into sections with each section number being a page number which contains the map to that area. To complete the Oregon challenge you have to find a cache in each of the sections of the Oregon DeLorme book. I The cache you log must be in Oregon. Only regular and virtual caches from each block will count, no locationless or event caches. You can also meet the requirements for each block by placing a cache in that section. Remember all caches logged, or placed, must meet the guidelines including not setting vacation caches that cannot be maintained, All caches must be bona fide caches logged or placed by you. I will accept previous finds or hides if they meet the guidelines. After completing the challenge you will need to send me a list of the caches found or hidden so it can be verified the challenge has been completed. If there is a question, please feel free to contact me and we can discuss it. All final decisions, of course, belong to the cache owner. After it has been confirmed the requirement of the challenge has been met, I will send you the coordinates and clues to the final cache. Once completed I will also make arrangements to send you the first finder prize. As for the first to find prize, it has been suggested that I give a one of a kind, handmade, Oregon agate necklace (Duck makes these) to the winner. Due to the extent you will have to go to complete the challenge it has been decided this would be the thing to do. So, get out that Oregon DeLorme book and head out into the wilds of Oregon to find those caches. Most of all, Have Fun.